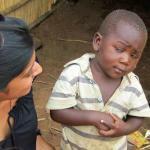 Skeptical third world kid knows better. Just because it's believable, doesn't make it true. If you met the people there, you wouldn't have the heart to call Haiti a "shithole country". If anything, certain Americans, notably the president, make me think that America is a shithole country. The people might be good, but their country is a shithole. Also, a lot of the people aren't good. More so than almost any other country. They have one of the highest violent crime rates in the world. My heart isn't so soft as to burst when I hear a shithole called a shithole. Go live there and tell me how wonderful it and it's people are. Until then... stop repeating what that crybaby emotional puppet master on CNN told you to think. By the way, good job ignoring the question. Got evidence he actually said it? The crime rates could be caused by the poverty from the earthquakes and other natural disasters, which is a massive factor. The crime rates have been there for decades. Really no CNN? That's the same ignoramous argument that albino chimp made. It probably got passed around from one bad news site to the next. They just repeat the same things over and over until every one has heard them. If enough people say it, it must be true. I still don't see a link that proves he said anything. As well as the natural disasters and poverty. Secondly, I didn't hear the whole "shithole country" thing on CNN; I heard it off of this site. Crime rates are high, poverty has always existed, low to no education, constantly hammered by natural disasters, little to no health care. Jeez, that place sounds like a real shithole. So what if he called a shithole a shithole? Why does that bother you? He didn't say anything about the people, just their shity country. Your site is nothing but hearsay. Same as every other media source. No proof and Trump gets criticized across the globe because his own countries media is against him. Lots of proof and Hillary is still not in prison for treason. Wake up. The media belongs to the dnc. They'll do anything to tear Trump down, even lie to the whole world. Actually, especially lie to the whole world. 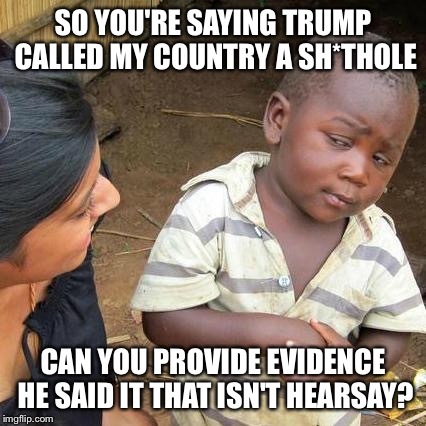 SO YOU'RE SAYING TRUMP CALLED MY COUNTRY A SH*THOLE; CAN YOU PROVIDE EVIDENCE HE SAID IT THAT ISN'T HEARSAY?